The acoustics in a modern car is very important. The drivers usually install a car stereo and two speakers ago. But the special music lovers prefer to embed speakers still in the front door. This increases the overall volume and allows you to fully enjoy the music. Speaker installation in front doors - employment is difficult and requires patience and skill. Disassemble the front door panel. To do this, Unscrew the interior door handles and remove the panel. It is secured with clips. The best place to put speakers is the lower right side. In this location the speaker will not interfere with door elements, such as glass door locks and handles door opening. But you can install at any place of the door if desired. Saw out the hole for the speaker. This should be done with a jigsaw for metal. The hole should be the diameter of the dynamics of a few millimeters. This is necessary to ensure that the column was a tight hole. Thereby creating an independent fixation dynamics in a door. Immediately saw a hole in the door panel. Before that, right space bar, otherwise you don't get holes. Make a mount for the speaker. This is the most critical part of the job. Properly mark the location of the future dynamics. To strengthen you should use the plates that will be screwed to the door with screws. The same screws will attach the speaker to the plates. 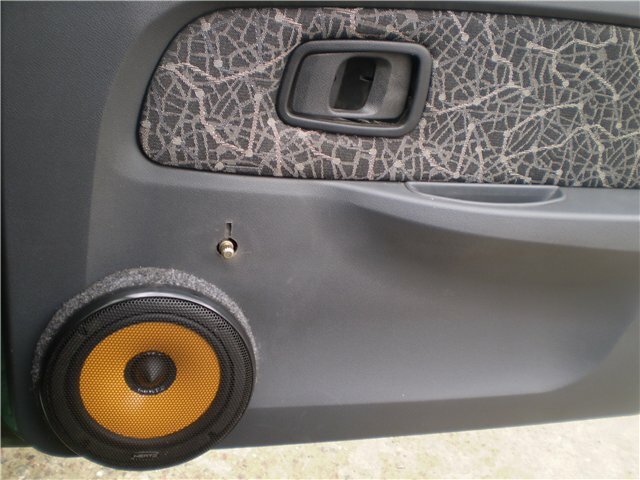 You need to accurately choose the size of the plates, otherwise the speaker will be much bulge. Such plates should be four. Each of them is fixed in its angle. Also you can cut a ring out of plywood and insert it into the cut hole with glue to secure it, then install a speaker into this ring and secure with screws. Drill a small hole in the inside of the door where there are hinges. Next, drill another hole opposite the first. Here we need to extend the wire from the radio to the speakers. Hide them under the bar while pulling. At the junction between the two holes of the door, put the wire on PVC tube. This will prevent cutting the wires on sharp edges of drilled holes and a further circuit. Connect the speaker and assemble the panel. During the connection, insulate the exposed places with electrical tape. Otherwise you can not avoid circuit.